What can I say except that today was dire, the weather was awful and it appears that winter has set in now. Today we were joined by a new member, Glynn and also the gang from Rochdale and Stockport. This cheered me up immensely because last week I was very despondent and was wondering if I should continue with the campaign. It’s hard work, and I do have weeks like this. Anyway, blip over and onward I shall continue. Just to make it clear we handed out five food parcels and offered help, advice, leaflets and signposting to everyone that we spoke to today. No one left without receiving any help. We also helped out with things such as bus fares and other issues. I arrived at ten on the dot and was almost immediately met by Gordon and then Glynn. A few people were waiting for food parcels and I had a chat with a fella that’s trying to overcome several issues. I like our conversations and he’s looking a bit better, to be honest, I’d worry if I didn’t see him. We unloaded the food parcels and settled into our morning. 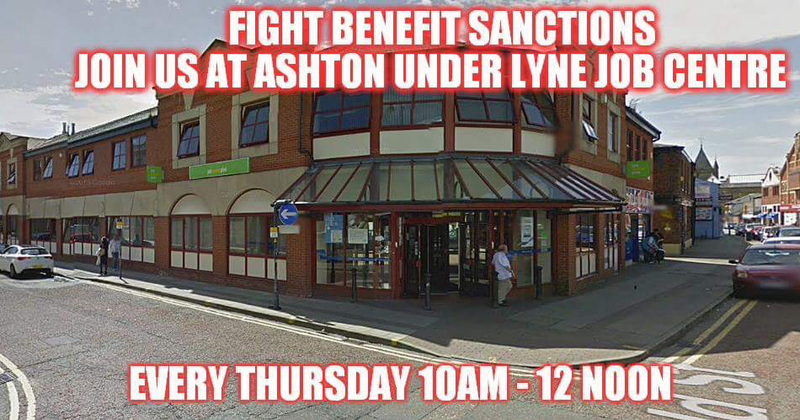 I first noticed a young man walking out of the Jobcentre shouting ‘Universal credit is a ball ache and they are all a bunch of w*****s’. He didn’t stop to talk but I guessed that he was unhappy. He obviously isn’t feeling supported by the system like Theresa May keeps spouting out the lie that everyone is supported. Absolute rubbish, its survival of the fittest nothing more. A young man caught my eye, he was walking out of the Jobcentre wearing very thin clothing totally unsuitable for this weather. I asked him how things were going, he told me that he was only just coping. 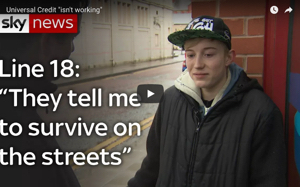 He’s in receipt of universal credit and had to wait around five weeks for his first payment. In the meantime, he had to apply for loans from the DWP to pay his rent so he now has to pay that back out of his monthly payment. He expressed his concern that whilst his repayments are £20 a month, he knows people that are having to pay back their loans at a much higher rate, and he wanted to know what there isn’t an official set repayment scheme that’s low enough to enable people to survive. He’s still reliant upon food parcels to survive because he has to contribute towards his rent. He asked a good question, there should be a low, set payment programme in place and not a random one that makes it impossible to live. Maybe there is, but its rarely enforced not unusual for this farce of a system. A man walked out of the Jobcentre and I asked him if he was ok, he looked at me and said ‘same old crap’ and walked off. I then spoke to a fella whom I shall name Brian. Brians an older chap and has been thrust into this system by no fault of his own. Brian is in receipt of a small private pension and was claiming JSA (Jobseekers allowance). He had £6 taken from his JSA because of his pension. Brian was visited by a member of staff from a local housing association and was told by them that he had to immediately stop claiming JSA and make a claim for universal credit otherwise his rent wouldn’t be paid. They were wrong. Brian could and should have stayed on JSA until the DWP transferred him, they should never have told him this. So thanks to their wrong advice Brian is now £250 a month worse off. He’s an older chap, he’s struggling and all because his landlord decided to get greedy and demand that he move onto universal credit. Brians an older man who was brought up in another time, a time when you could trust people and were looked after. Brian isn’t to blame for this, the blame lies at the housing associations feet. I’ve spoken about this before, one week we had about five or six people stop us and tell us that they had been told this also. I’ve also had neighbours knock on my door telling me the same thing, so I know it to be true. We are taking further action on this though. They shouldn’t be lying to people like this, they are responsible for the suffering of people and we can’t allow this to go unchecked. This housing association recently merged with another organisation and have kicked all of the local councillors off their board and as a result appear to be doing whatever they want. Rumour has it that they aren’t good employers and they aren’t as supportive to tenants as they could be. We were then introduced to another older man whom I shall name Terry. Terry had worked all of his adult life until he became ill, he was proud of working and smiled when he spoke of his younger days. Terry is a lovely man that deserves much better than what he told us. Terry had to go for his PIP assessment, he’s new to this and the system confuses him. They asked him the usual questions and he left the assessment thinking that he’d be ok.
Terry was wrong, in fact, he couldn’t be more wrong. He failed the examination on the basis that he hadn’t had a fit in his kitchen and he looked too smart. Terry assured us that he wasn’t dressed too smart, he isn’t well off and was wearing the same clothes that he wears every day. And as for not fitting in the kitchen, that’s ridiculous. Like he says he can’t predict where and when he will have a fit. It’s ridiculous. Terry is appealing this decision, he’s angry that he’s being treated in this manner. Terry is also an older man whose health is failing and is especially vulnerable. The government doesn’t give a toss about Terry, they just want him off the unemployment statistics and will do so by any means possible, especially by employing people to lie like this. I heard a conversation behind me so turned round to join in. Here’s a rundown of the conversation. I’ll name the person concerned Paul. Paul is also an older man. Paul has always worked and is proud of this. Paul became ill with diabetes and lost his leg and toes. Paul feels like he’s always being scrutinised by the DWP. They keep sending him to medical assessments etc. Paul hasn’t got a clue how the system works. Paul is terrified of being moved onto universal credit. Paul says it’s not fair and they shouldn’t be doing this to him. Paul is correct, but thankfully Paul now knows that we are thinking about him and he can chat to us whenever he wants to. Paul is just another statistic and this makes me angry. We all need to fight in our own way for people like the above if you’re not in a position similar to theirs you could be in the future. Say hello to your neighbour, to the stranger in the street. That can make a massive difference. We spoke to lots of other people, and we helped lots of people. This made us smile, someone left us a calling card. Thank you! We love it. BTW if one of my readers left this sticker, please email me I wouldn’t mind some. Thanks. We don’t receive any funding for the work that we do, nor do I receive any funding for the blog etc. If anyone would like to donate there’s a button above and to the side. I would be very grateful, and a massive thank you to everyone that has supported my blog and also to everyone that reads and shares my blog. Thank you!! In the past week, I’ve been on Granada Reports, Talk Radio, filmed with RT News and have been interviewed for a magazine. None of which are paid, but it’s important to get the word out there. The campaign certainly doesn’t finish on Thursday afternoons.